After over a year of major construction, Oxford Properties Group’s new Méga Parc at Galeries de la Capitale, Canada, has opened its doors. The site is Canada’s largest indoor amusement park. 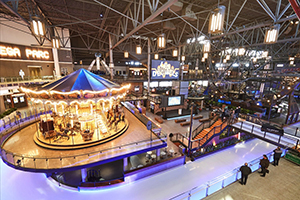 The CA$52m site has 18 attractions including North America’s first spokeless Ferris wheel, a roller coaster, bumper cars and the longest indoor skating trail in Canada. Other attractions include Force G, the classic Condor and the majestic Carrousel. Bradley Jones, head of retail at Oxford Properties Group expressed his hope that the park will help redefine the customer experience at Galeries de la Capitale. “Retail is changing, and the mall is no longer simply just a place to shop but a destination to enjoy world-class experiences across fashion, food and entertainment that can’t be recreated online,” he said.